We Search Trusted Retailers DAILY to find you the best deals on Toasters and the latest Toasters sale to save you money. 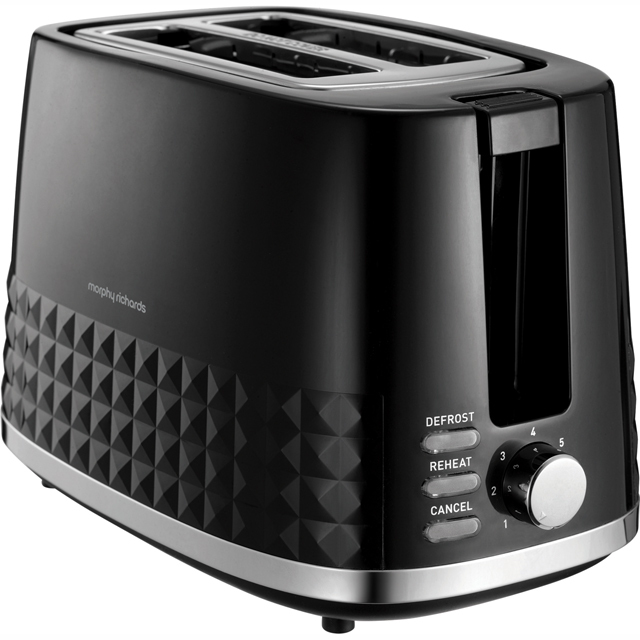 Showing Morphy Richards 220021 Dimensions 2 Slice Toaster - Black sales, deals and offers. When looking to buy a cheap toaster, you're probably thinking there really isn't to much to look for in the way of different features. Choices come in the way of which brand you want, the different colours available, and probably the biggest choice is how many slices of bread can it toast at once. But there can be more to a modern cheap toaster than the choices above. Defrost Feature This one is worth looking out for. It allows you to defrost your bread, and then toast it straight after. Some even do this all at once. Removable Crumb Tray Good for keeping your toaster nice and clean and not make a mess all over the counter top. Reheat If you've been a little distracted and let your toast cool, this is good for giving it a bit of a heating up. Wide Slots If you're into some thick cut bread, or rustic slices, then you might want to get a cheap toaster with wider slots so they fit better. High Lift Facility As with the wide slots feature, this is good if you like small artisan breads that don't lift all the way out of a normal low priced toaster. Bagel Function For those that are into bagels, this is a bit of a must have function to have. Variable BrowningThere's not a toaster made in the last 20 years that doesn't have this feature, so expect it on all and even the very cheapest toasters. Cool Touch This will stop you getting your hands burnt if you touch the sides of your toaster. Cancel Button Pretty clear what this does and most toasters have them, even the low priced ones. Lift & Look This is a cool little feature that we like the ideal of. Being able to see how your toast are doing without cancelling the toasting. Motorised Lower And Lift Bit of a fancy feature found in the higher priced toasters. Illuminated Controls Great for midnight snaking in the dark, every other reason for this feature escapes us right now. Keep Warm Function If you aren't quite ready to butter up these toast treats yet then check out the keep warm option. A Bit MoreScraping the butter tub on these features now. The bit more feature, puts you toast back in for, wait for it, a bit more. Genius. Cable Storage Really good feature if you want to take your toaster round to your friends house to show off, but don't want the cable flapping about. On the flip side if your the person who would take your cheap toaster round to someones house to show off, you probably don't have to many friends. Fruit Loaf Function It's called a fruit loaf function, but it's no different than a bagel function, or wide slots, or high lift functioned for that matter. Manual Control These are a great feature to have on a cheap toaster, because if they wasn't their, how could we toast are bread. There would be anarchy on the streets. Motorised Lift Because lifting 2 or 4 slices of thick bread can be hard on your hands. Detachable Bread Support Your guess is as good as ours on this. It could be a support group that comes round to cheer you on when you go to remove your bread. More than likely it will be some sort of attachment that helps warm your bread up. There are loads of brands of toaster to look at, but well break them down into 3 different categories to make it easier. We'll look at the budget brands, then the mid range ones and then the high end toaster brands that may set you back a pretty penny, but they'll look good in your kitchen. Cheap Toaster Brands When it comes to the cheaper brands, we feel that shopping for retailers own budget brand is the way to go. Argos have a great range of 3 different brands of their own. Simple Value is super cheap and anyone who has been a first time buyer recently will more than likely know this brand well. Cookworks is also from them and is just a bit of a step up from Simple Value, then they have ColourMatch, this is a great way to get all the appliances matching identically in your kitchen. If you prefer to shop at Currys, then they have the Essentials brand. These are also super cheap toasters that are perfect for first time buyers. All these brands offer really low prices on toasters and if you're on a tight budget will more than do the really arduous task of applying heat to bread to turn it in to toast. Mid Range Toaster Brands For the mid range brand of toaster, there is a load of choice. From well know household names, to entry level models from some really top brands. Breville and Russell Hobbs are just two of the quality brands that have 2 slot base models for fairly cheap. Morphy Richrds have a really nice looking 2 slice toaster that we feel is a great buy for a really modern looking, but retro feel kitchen. It's the Morphy Richards 222003 Accents and it's a cool baby blue colour. But the one we feel offers better value for money is the Breville Impressions VTT range. there are a voices range of colours to choose from and they are all modern looking colours. They have 4 slots, look great and get amazing reviews. All that for £30 at AO.com. Top Range Toaster Brands When it comes to the Rolls Royce of toasters then KitchenAid, Sage and Smeg are the ones that you should be looking at. They have some amazing looking designs and packed full of cool toaster features, said no-one ever. They can get fairly expensive though. So best leaved for those with a very healthy budget, or people seriously into toast. KitcheAid have a 4 slice toaster for £270, yep, that's right, £270. It is a cool looking toaster though. These are just a few of the brands that you can find at Argos, Currys and AO.com. They have loads more and they are all laid out here for you too see from the cheapest toasters, all the way up to the most expensive ones. This makes it really easy for you to see which ones are giving you the best deals on the toasters you like in your price range.